BATON ROUGE, La. -- Louisiana's attorney general has ruled out criminal charges against two white Baton Rouge police officers in the fatal shooting of a black man outside a convenience store. Attorney General Jeff Landry's decision Tuesday comes nearly 11 months after the Justice Department ruled out federal criminal charges in Alton Sterling's July 2016 death. Landry made the announcement after meeting with family members of Sterling. Veda Washington-Abusaleh, Sterling's aunt, was in tears after meeting with Landry. Officer Blane Salamoni shot and killed Sterling during a struggle outside a convenience store where the 37-year-old black man was selling homemade CDs. Officer Howie Lake II helped wrestle Sterling to the ground, but Lake didn't fire his gun. The shooting came amid increased scrutiny of fatal encounters between police and black men. Two cellphone videos of the shooting quickly spread on social media, leading to protests during which nearly 200 people were arrested. The officers' body cameras and a store surveillance camera also recorded the encounter, but those videos have not been released. Federal authorities opened a civil rights investigation immediately after the shooting and released their findings in May 2017. They said Salamoni yelled that Sterling was reaching for a gun in his pocket before shooting him three times, and then fired three more shots into Sterling's back when he began to sit up and move. The officers recovered a loaded revolver from Sterling's pocket. As a convicted felon, Sterling could not legally carry a gun. Sterling had pleaded guilty in 2011 to being a felon in possession of a firearm and illegally carrying a weapon and was arrested in May 2009 after an officer confronted him outside another store where he was selling CDs, court records show. Federal authorities concluded there wasn't enough evidence to prove Salamoni or Lake willfully deprived Sterling of his civil rights, or that the officers' use of force was objectively unreasonable. 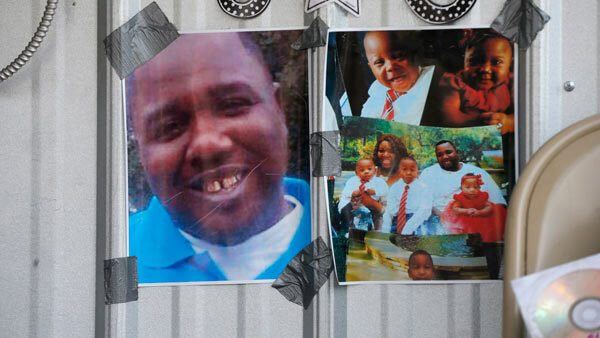 Alton Sterling was laid to rest in Louisiana on Friday after being shot by police in Baton Rouge earlier this month. The officers encountered Sterling after responding to a report of a man with a gun outside the Triple S Food Mart. The officers told Sterling to put his hands on the hood of a car and struggled with him when he didn't comply, the Justice Department said. Lake shocked Sterling with a stun gun before the officers wrestled him to the ground, according to federal investigators. Attorneys for Sterling's relatives have said federal authorities told them that Salamoni pointed a gun at Sterling's head and threatened to kill him before the struggle began. In a summary of its findings, the Justice Department said Salamoni pointed his gun at Sterling's head but didn't mention any verbal threats by the officer. Racial tensions were still simmering in Louisiana's capital when Gavin Long, a 29-year-old black military veteran from Kansas City, Missouri, ambushed police officers near a car wash on July 17, 2016. Long killed three Baton Rouge law enforcement officers and wounded three others before being shot dead. Police say a Marine veteran shot and killed three law enforcement officers in Baton Rouge, Louisiana. East Baton Rouge District Attorney Hillar Moore recused himself from any state criminal investigation into Sterling's death, citing his professional relationship with Salamoni's parents, who have served as police officers in Baton Rouge. Moore's recusal left Landry's office to review evidence and decide whether any state charges were warranted. In June 2017, lawyers for Sterling's five children filed a wrongful death lawsuit against the city of Baton Rouge, its police department and former police chief, and the two officers involved. Their suit alleges the shooting fit a pattern of racist behavior and excessive force by the Baton Rouge police. It also claims poor training and inadequate police procedures led to Sterling's death. The mass arrests of protesters after Sterling's death spawned lawsuits that accused police of using excessive force and advancing against peaceful protesters while wearing military gear and gas masks and brandishing assault weapons. In October, a federal judge approved a class-action settlement that awards up to $1,000 in cash to dozens of protesters who claim police violated their civil rights. Police prepared for another round of protests before the Justice Department announced its decision last year, but the response was far more subdued. After learning neither officer would be charged with federal crimes, dozens of people held a peaceful vigil outside the convenience store where Sterling was shot.